Kara Zor-El is in the skies of I'Noxia confronting replicant versions of friends and foes form her memories. The Cyborg Superman is using them as a means of getting Supergirl so he can use her flesh in a surgical procedure to regain his memories. In other words, we see pretty much everyone she's met in previous issues. He has also made a deal with the I'Noxians to protect them from the wrath of his master Brainiac. However, Cyborg is not concerned about him. He only cares about learning who he really is, and he won't let anyone - even Brainiac and Supergirl - stand in the way of that. The battle with her past has caused Kara's Kryptonite poisoning from "H'el on Earth" to worsen. The Cyborg Superman and his minion Delacore haven't a moment to lose. They must perform their operation soon even if it means the total annihilation of Kara Zor-El. Placing Kara in glowing blue rings while getting their equipment ready, the Cyborg Superman and Delacore make preparations for the surgical procedure. The bands imprisoning Supergirl change from a glowing blue to a fiery red causing her great pain until only her costume remains. Dissolution is complete. Now, it is time for the next step. The Cyborg Superman is on a table as devices do their work on him. Suddenly, Brainiac's skull ship arrives on I'Noxia prompting Delacore to want to abort everything. However, Cyborg refuses to permit even Brainiac to stop his plans even if it could bring about the destruction of I'Noxia. The Cyborg Superman's machines finish their task. All that is left behind is armor with an S shield family crest of the House of El. A full humanoid male is now in the place of being that was part machine. 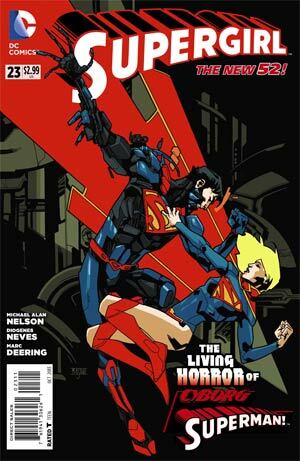 Yet, the shock of his identity comes to both himself and the reader as he is revealed to be Zor-El, father of Supergirl. Has the Maid of Mighty perished so that one of her parents may live? Is he really Zor-El, or is he a clone? Did Kara's memories influence the transformation of the Cyborg Superman? The answers to these questions will possibly be found next month. Story - 4: The vast majority of this issue feels like one of those clip shows from old television series that tell viewers what happened previously. The last pages, particularly the final panel saved the book from being too redundant and getting a worse rating. Michael Alan Nelson seems to be finding his way around Kara's character and world, which makes some parts of his run so far a little rough around the edges. Yet, he is slowly but surely improving little by little. This comic is finally growing on me more since the first creative team left it. Art - 5: The art has gotten better even if I still miss Mahmud Asrar's interiors. It probably would have gotten a three for just merely telling the story as nothing really sticks out to show Diogenes Neves' style. Yet, he seems to be warming up to the world of Supergirl, and he's showing vast improvements in his work since he's started. Cover Art - 5: This particular cover seems influenced by Mike Mignola. It's still a beautiful image that made me want to read the book, but the change in style made me think Mahmud Asrar had taken some time off. In spite of this, he did great work on it.